For economical home heating, more home- owners are rediscovering the benefits of anthracite coal. The move toward this abundant source of American energy has prompted the rediscovery of perhaps the most reliable anthracite-burning heating unit American home-owners have ever known: the EFM Stoker-fired Warm Air Furnace. The rugged furnace is still manufactured with the same quality workmanship and matched components that helped earn its reputation. It is completely automatic, simple in design and all moving parts are accurately machined for quiet operation. Coal is automatically moved from bin to burner. Ash is neatly deposited in a container in the unit's dust-tight base. The burner operates with a clean, smokeless flame which is controlled by the thermostat...the intensity of the flame is adjusted with fingertip control. 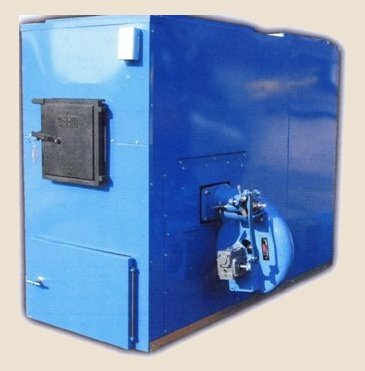 Operation is fully automatic and the EFM Stoker-fired Warm Air Furnace can be relied upon for safe, unattended operation. Beautiful azure blue durable powder coat jacket thoroughly insulated against heat loss. Right or left hand coal conveyor. Conveyor worms of stainless steel-resists corrosion. Air and Coal carburetion can be readily adjusted. Ratchet drive- No belts, gears or pulleys to change. Cost of maintenance - about half that of other makes.